VU LINH, Vietnam — On a 1996 tour of northern Vietnam, Fredo Binh walked through Vu Linh commune, a cluster of traditional stilt houses beside rice paddies, eucalyptus trees and a tranquil lake. The village, which at the time was accessible only by boat or off-road vehicle, was populated mostly by Dao, one of 54 ethnic groups recognized by the Vietnamese government. Mr. Binh, who is French-Vietnamese, later made Vu Linh a regular stop on the motorcycle tours he runs from the Vietnamese capital of Hanoi Vietnam. In 2006, he bought a Dao stilt house in the area, moved it to the lakeshore and opened an ecolodge called La Vie Vu Linh. 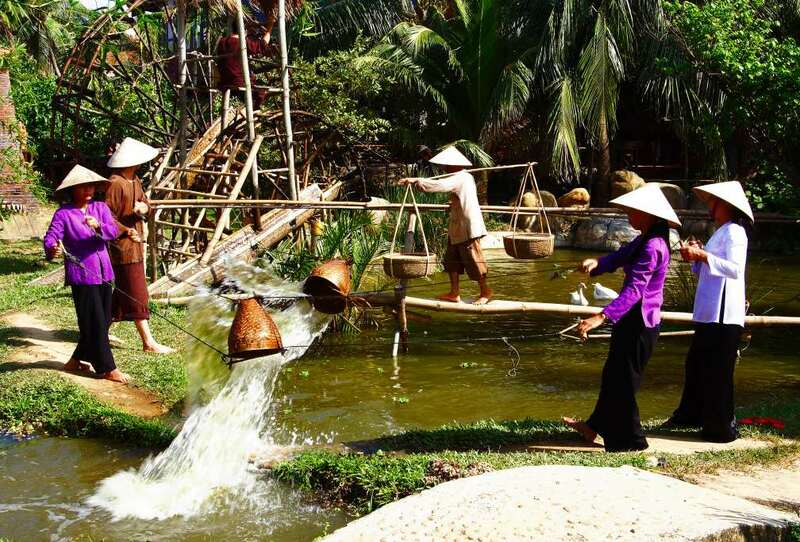 As international tourism grew in Vietnam over the past decade, the country’s rich mix of ethnic minorities and their distinctive cultures became attractions. A few foreign entrepreneurs opened accommodations in the villages of ethnic minorities, hoping to attract foreign travelers interested in their brand of tourism: supporting communities through employment, language and skills training and often long-term purchasing agreements with farmers and artisans. The lodges are a departure from the typical accommodations available in and around the northern town of Sapa, the epicenter of the country’s ethnic-minority tourism, where the usual choice is between Vietnamese-owned hotels and basic homestays. But while many guests have enjoyed the boutique retreats, Mr. Binh and other managers say, they have not been particularly successful from a financial standpoint. Topas Ecolodge, 11 miles from Sapa, was one of the first foreign-run lodges in the ethnic hinterland. It sits atop terraced rice paddies at an elevation of about 3,280 feet and has panoramic views of the nearby Hoang Lien Son Mountains. The lodge has 25 bungalows and a restored stilt house that was remodeled to reflect Scandinavian design elements. A two-night stay, including breakfasts, train travel from Hanoi and a shuttle transfer, costs $236 per couple. The lodge employs about 60 full-time workers, mostly from six local ethnic-minority groups, Mr. Koppen said. Most of the staff members receive years of language and hospitality training, and the lodge purchases the bulk of its food, materials and decorations locally. The lodge has not yet broken even, Mr. Koppen added, but it was never intended to be what he called a “tourism factory” whose only goal was making money. Lo A Cuong, a tour guide from the Tay ethnic group, who has worked at Topas Ecolodge for nine years, said the lodge was seen by people in nearby villages as a good place to work and learn new skills. He said many tourists were impressed by the lodge’s picturesque setting and proximity to traditional farming. “They don’t have rice fields like this in their countries,” he said. In 2013, Bho Hoong Bungalows, a similar business to Topas Ecolodge, opened in an ethnic-minority village in central Vietnam. It is about 50 miles inland from the coastal tourism magnet of Hoi An, a Unesco World Heritage site, and just a stone’s throw from the former Ho Chi Minh Trail, the supply route used by North Vietnamese troops during the Vietnam War. Bho Hoong villagers are from the Co Tu minority group, and Active Adventures Vietnam, the local company behind the business, markets the lodge as an authentic experience with a “modern twist”: The five bungalows have contemporary amenities like king-size beds and marble-accented bathrooms. As the country becomes more of a mainstream destination catering to mid-range and high-end travelers, more clients “want the experience but don’t want to rough it,” said Mark Wyndham, the managing director of Active Adventures Travel Vietnam. Guests can enjoy treks and ethnic music performances by villagers, but the project’s most important achievement, Mr. Wyndham said, is generating extra income for locals that may help preserve traditional cultures or reduce pressure on young people to migrate to the cities. “It’s, in a sense, trying to hold back a bit of globalization,” he said. The project is more than just a business. It was created in coordination with the provincial authorities and the International Labor Organization, a United Nations agency that provided technical assistance and $50,000 in initial funding, said Nguyen Thi Huyen, national coordinator for the agency’s sustainable and responsible tourism program. Ms. Huyen said her office viewed public-private tourism partnerships as a promising model that could spread beyond Bho Hoong to other Vietnamese regions. At La Vie Vu Linh, Mr. Binh’s efforts do not just provide Dao villagers with jobs and tourists with somewhere to sleep at 1.2 million dong, or $55, a night, or less, for a private room. He has also recruited teachers to give his employees lessons in English, French, hospitality, theater and even circus arts. (Before moving to Vietnam in the 1990s, Mr. Binh managed a traveling circus camp in Ireland.) He said he also planned to open a floating fruit and vegetable market on the lake to promote sustainable agriculture in Vu Linh. Tuong Van Thuong, a villager, said the lodge benefits the local economy and has helped promote and protect Dao culture. He said he and several other neighbors were operating their own homestay businesses. Antoine Colmet-Daage, a French graduate student, visited La Vie Vu Linh in 2013, as part of a weeklong motorcycle tour of northern Vietnam. He said he enjoyed learning about Mr. Binh’s farming projects and noted that the modern comforts and tranquil setting were a relief after long days of riding bumpy roads on a motorcycle. He added that he was surprised to find that he and a friend were the only guests. “I didn’t understand how a place like that could be so empty,” he said in a telephone interview from Toulouse, France. On a recent afternoon at La Vie Vu Linh, the premises were again all but empty, except for Mr. Binh, his wife and a few of the lodge’s 15 employees. Mr. Binh acknowledged that he did not advertise — most of his bookings are made through travel agencies or international schools seeking cultural immersion programs. He has not recouped his initial investments, including about $350,000 for structures that accommodate as many as 80 guests, and $6,000 for solar heaters and water filtration and biogas-capture systems. The expense “almost killed my company,” he said with a laugh, referring to his motorcycle touring business. Mr. Binh hopes that he will break even in two years and that the recent opening of a highway between Hanoi and the Chinese border — Vu Linh lies slightly more than 100 miles from each — may increase bookings. But he was quick to add that La Vie Vu Linh is not a hotel but a project that blends tourism, ecologically conscious agriculture and long-term education for his employees.